Sometimes it's hard to do the right thing whether it's eating your vegetables as a kid or staying away from fried foods as an adult. 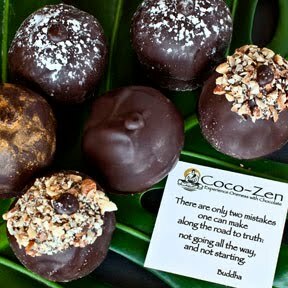 But, Coco-Zen makes it easy for you to do the right thing: their chocolates areFair Trade Certified and use only organic ingredients. 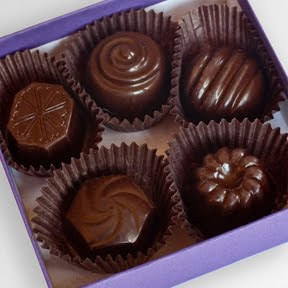 And as a reward for your virtue, these chocolates are also rich, luscious, flavorful and creamy. I think it's important to mention (even though this is a chocolate review) that most of the cocoa we consume comes from mass candy businesses that have a devastating impact on the environment and the communities around them. They require heavy forestation, chemical fertilizers and pesticides. And these companies exploit the local communities, adopting unsafe working conditions, poor wages and sometimes even forced child labor. This is why, in a time where resources are rapidly depleting, that we need to remember that our actions affect the world around us. 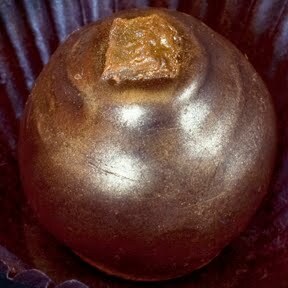 This is mantra of Coco-Zen - to Experience Oneness with Chocolate. 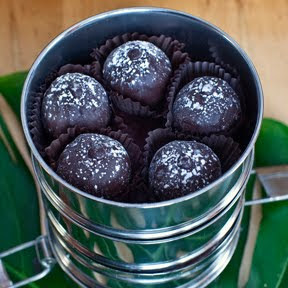 Coco-Zen's Truffles-To-Give arrive in an Indian Tin. This is a stack of tins is actually an Indian lunch box. (In fact, all Asians - Chinese, Japanese, Koreans, etc. - use themYou put rice in the bottom tin and the goodies to add in the top tins. Yum!) When you take the lid off, you become aware of two things. The first is that these truffles are enormous. Bigger than a golf ball although smaller than a baseball. The second is the aroma of chocolaty goodness just wafting out. 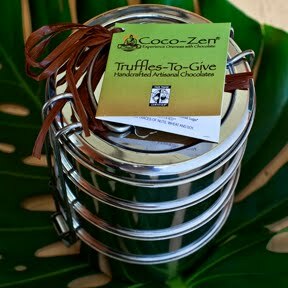 Each Coco-Zen tin reveals a new insanely tempting flavor: Chai Spice, Mint Bliss, Orange Blossom (with the nuts) and Dark Chocolates. Our selections were vegan, yet there was no discernable difference between them and any chocolate made with butter and cream. Each truffle had a rich and meaty ganache nicely balanced with the harder texture of the chocolate couverture. 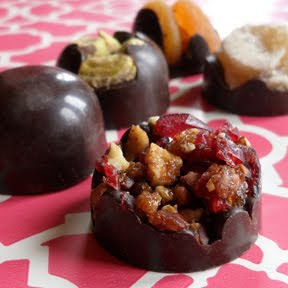 We started our journey with the Coco-Zen Orange Blossom as the nuts on top appealed to everyone. 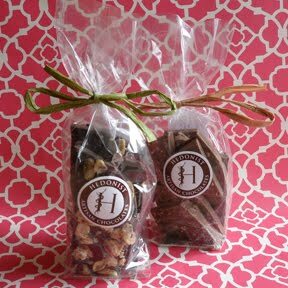 This chocolate had a nice but not overpowering orange flavor and the crushed almonds added to the a wonderful texture. 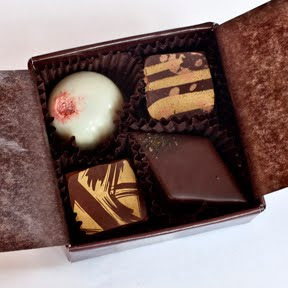 We decided to follow with the simple Dark Chocolate - to cleanse our palette - as it were. 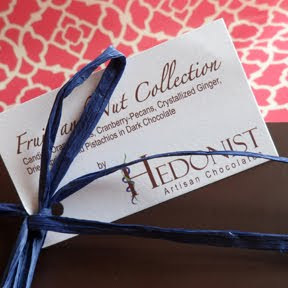 For chocolate purists, this chocolate has your name on it. Rich, earthy and flavorful. You can enjoy all the nuances of chocolateness (if there was such a word). For mint lovers, the Coco-Zen Mint Bliss is nothing short of chocolate mastery. I think it is hard to get the right balance of mint to chocolate I think because each flavor is quite strong. But Coco-Zen, gets it perfectly. 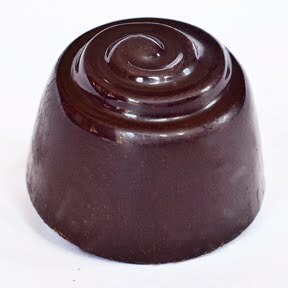 This chocolate would not only serve as a wonderful finish to a meal, one of them could be the entire dessert. My personal favorite was the Chai Spice (except for the Orange Blossom, Dark Chocolate and Mint Bliss). I love chai and have ever since I was small. It brings back memories of my childhood neighborhood, which was home to immigrants, trying to make their way into the American life--or their version of it. We had Italians, North Indians, Dutch, Germans and of course our Chinese family. What this really boiled down to was we had really good food pretty much all the time, including the chai tea one of the mother's made on the stove for us when we showed up on her porch with hungry faces. The delicately spiced but still rich flavor of the Chai Spice's ganache had the best elements of the chai I remember, wonderfully enrobed in dark chocolate that melts away perfectly. Once in a while, and generally not often enough, you deserve a day of pampering. Once that meant getting your hair and nails done, a facial, a massage and perhaps buying some newfangled lotions that you know will absolutely change your life. But, in these economic times, you have to be more resourceful. You can create that same wonderful spa experience in the comfort of your own home. This involves locking yourself, and everyone else in your life out of the bathroom (except maybe your cat), running a hot bath with some salts, oils and bubble bath, or whatever combination of those elixirs appeals to you, lighting some scented candles and stepping in and relaxing. But to complete the effect, I believe bon-bons are in order. That is where the luxurious Aroa Fine Chocolates come in. 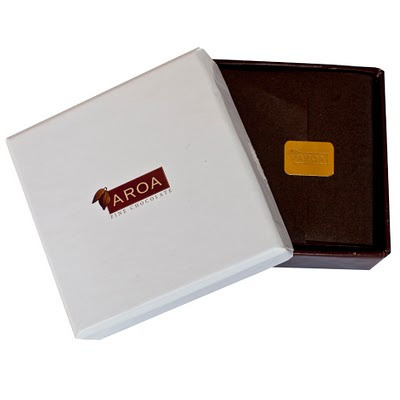 Since this is all about experience, I must describe the Aroa Fine Chocolates packaging. This is not a thin, flimsy, cardboard box but a box with heft and quality. 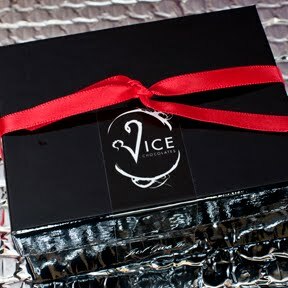 The kind of box that could just as easily hold velvet and something that is measured in carats. When you peel back the tissue paper you reveal a treasure just as gratifying as one that might sparkle from your ear: extraordinary chocolate. For our sampling we enjoyed four Aroa Chocolates. 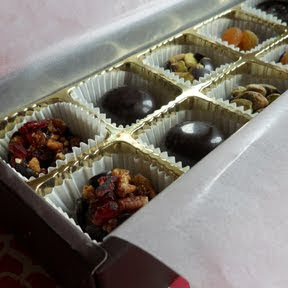 These chocolates are as sumptuous as they look so if you plan to take the time to enjoy more than four chocolates, you might end up with the unwanted side effect of looking like a raisin after your home spa. The first chocolate we tried was the Earl Grey. 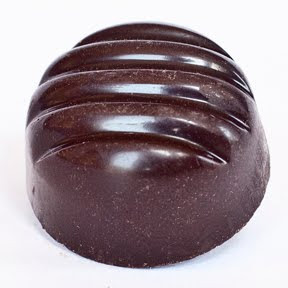 I love tea flavors and this elegant chocolate was a wonderful blend of sensuous ganache with a distinct but not overpowering Earl Grey flavor. 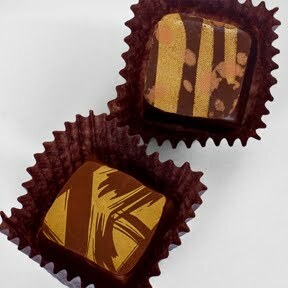 The last two chocolates we enjoyed were among the most beautiful chocolates we have ever seen. Each had a lavish gold design. These photos do not do them justice because in the photograph, you cannot see how they shimmy and shimmer before they are devoured. I happen to love chocolates with cinnamon but the addition of cardamom in the Chai bon-bon made this Aroa Fine Chocolate extra special. We finished with the Passionfruit. What made this chocolate stand out was the tartness of the fruit balanced with something minty while the ganache retained its buttery goodness and consistency. All in all, after our tasting we felt pampered from head to toe. Once in a while you get something unexpected. A photo enforcement ticket comes in the mail, even though you were praying ever since you saw the light flashed that it was for someone else's car. Then not only do you have to pay the ticket, you have to see a snapshot and ask yourself, do I really look like that? Do I really have my mouth open when I'm turning left? Why doesn't my photo look more like Gisele, whom I'd prefer to look like? Why is life so unfair? Other times the unexpected is much better. For example, when you go shopping and the shirt you have been eyeing has been discounted to a price that you can actually afford. You feel the gods have shined on you. And that feeling is the precise feeling you get when you have a TerraSource chocolate. It would be safe to say that if it's chocolate I'll like it. But generally, vegan chocolates are a different experience from traditional chocolates that can use cream, butter and sugar with reckless abandon. 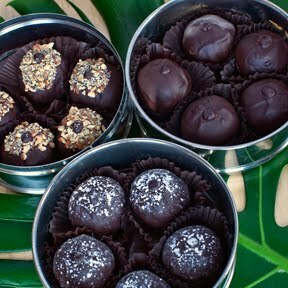 So, vegan chocolates ,while still delicious, are generally less creamy and the flavors are different from what we are accustomed to. Well, TerraSource chocolates turns all that upside down. 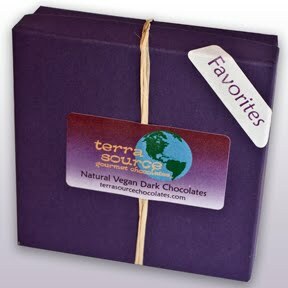 TerraSource chocolates are creamy and richly flavorful and in a blind taste test, it would be impossible to know these are vegan chocolates. 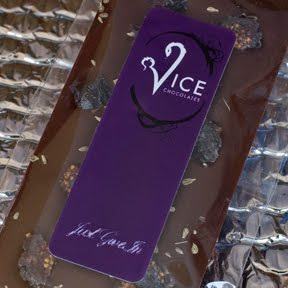 The rich and creamy chocolate taste is coupled with Josie Pradella's unique ability to pair flavors. 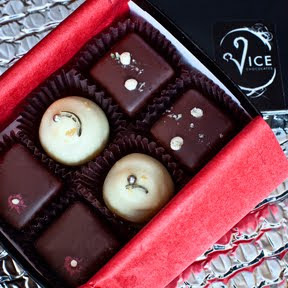 Her chocolates are so thoughtfully created that each one will stop you in your tracks. As I happen to love coconut, we started with Coconut Dream. The chocolate has a wonderful chocolate shell and the creamy filling has just the right amount coconut shreds for some crunch. When you are finished you wonder, what is that other taste that makes this so heavenly? Then you realize, Josie Pradella has added a touch of rum. For a tangy, fruity chocolate, you must try the Pomegranate White Tea. What's special about this chocolate is that after you get the tangy, fruity taste of pomegranate, it is followed with a lingering, dare I say meditative taste of white tea. 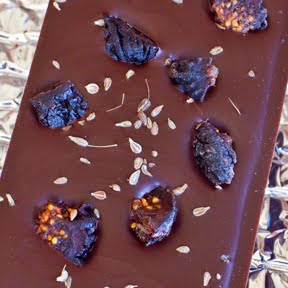 The Rooibos Tea was a huge favorite in this taste test and a great chocolate to convert anyone who is skeptical of vegan chocolates. Rich and chocolatey with an undeniable luscious caramel taste. Of all the chocolates, the Orange Ginger was the most subtle. A hint of orange, a hint of ginger and then the sensation of chocolate melting on your tongue. To me, this is a connoisseur's chocolate. A connoisseur who perhaps wears glasses at the the end of his or her nose, wears tweed and perhaps smells a little like spaniels. My favorite TerraSource chocolate was the Balsamic Strawberry. The chocolate shell was hard and almost crunchy but the filling once you bit into it was dreamy. It just melted in your mouth. It starts with a burst of fresh, just-picked strawberry but before it gets too cute you have the taste of balsamic vinegar. Even though it is unusual, I highly recommend that even the less adventurous take a walk on the wild side with this distinctive TerraSource chocolate!